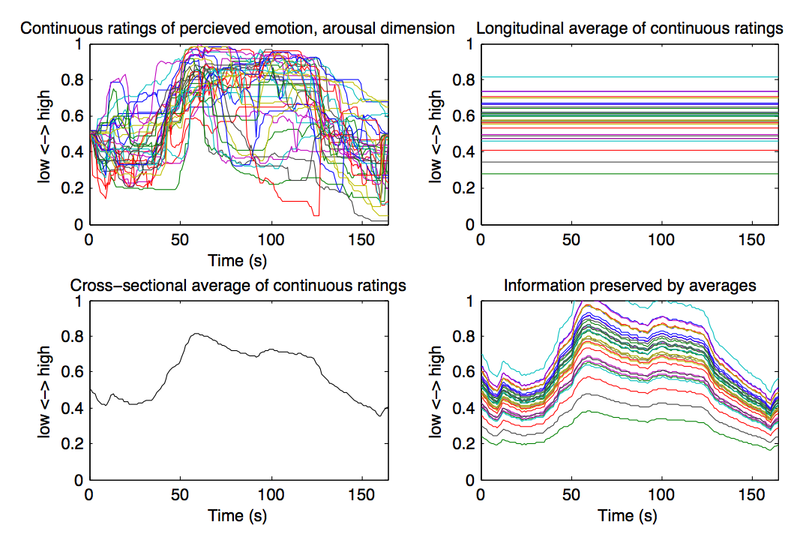 The top right corner is a real collection of continuous responses, 35 ratings of perceived emotional arousal to the Adagio movement of J. Rodrigo’s Concierto de Aranjuez (from Mark Krohonen’s public data set.) Beside it is the average value for each response over time. Below it is the average rating time series, evaluated at each time point. And in the last corner is the reconstruction of the data set from these two reductions–a collection of time series which is equivalent to the original according to the summary stats used. Comparing the top left corner to the bottom right, there are obviously differences, differences that either dimensional reduction treat as noise. However, it does nothing to show something interesting about that presumed noise, so I don’t think it is worth space in this paper. Still, the stratification is pretty, and a nice little reminder of what goes missing in these calculations. yeah… noise… isn’t it sweet?